The Animal, ridden by Lee Francois. Hart Photography. The Animal, by Cat Ichi, reserve champion of the NCHA Open Futurity under Lee Francois, took command of the NCHA/Metallic Cat Derby Open Semi-Finals with 222 points, as the first to work in the 46-horse field and was never topped. Mizpah Cat, by Auspicious Cat, with Tom Dvorak, and Reystylin Smooth, by Smooth As A Cat, with Justin Chalmers, each earned 220 points, the second-highest score in the Semi-Finals, where 20 horses with 217 points or higher qualified for Sunday’s Open Finals. Owned by Richard and Beth Carney Partners, Kemp, Tex., and bred by EE Ranches, owner and breeder of his sire, Cat Ichi, The Animal LTE $169,633, is a full brother to Ichis My Choice LTE $393,328, 2016 NCHA Open Horse of the Year, and out of My Little Abra LTE $64,220, by Abrakadabracre. 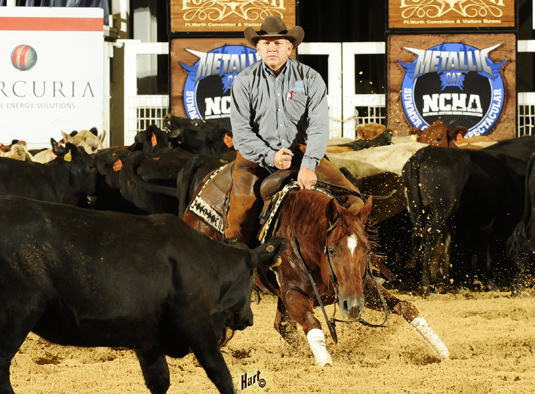 In addition to The Animal, Lee Francois also qualified for tomorrow’s NCHA Derby Finals with 218.5 points aboard Desires Mamie LTE $21,809, sired by Metallic Cat and owned by Woody Bartlett, Pike Road, Ala., and with 217 points on Rey Reddington LTE 20,771, sired by Dual Rey and owned by MLH Partners, Palm Beach Gardens, Fla.
Reystylin Smooth LTE $21,768 and Justin Chalmers, who tied with 220 points, also won the NCHA Derby Open Limited Finals with 220.5 points on Wednesday and earned 223 points, the second-highest score, in the first go-round. The Smooth As A Cat son was bred and is owned by Eddie and Barbara Young, San Angelo, Tex.